Stories about famous criminals seem to be a hot topic in my library right now. Maybe it’s because the theme for this year’s Collaborative Summer Library Program is all about heroes. (Every Hero Has a Story). Whatever the reason, National Geographic’s Weird but true! Stupid Criminals is one of the most popular books in my library. Where Stupid Criminals is a collection of humorous stories about criminals that did really stupid things that led to their capture, gifted writer Greg Pizzoli’s story is about a crook who was pretty smart. It must take a gifted mind to come up with the clever scam of selling the Eiffel Tower. So who is this master criminal? Let’s find out. In 1890, Robert Miller was born in what is now the Czech Republic. Smart and fluent in several languages, Miller left the University of Paris before completing a degree to become an artist…a con artist. He started by playing poker but after a run in with a jealous husband, Miller fled dry land to begin working on a transatlantic ocean liner. There he created his alias of Count Victor Lustig. “Victor” was a convincing count: exceedlingly well dressed, soft spoken, and always with lots of money to spare at the game tables. Once the ship docked and the passengers disembarked, “Count Lustig” would disaapear, along with their money. After conning Al Capone, fooling many with his Romanian Money Box hoax, Lustig left the U.S. for Paris. There he came up with the crazy scheme of selling the Eiffel Tower. Vic was convinced that if he could pull this off he could make enough money to secret his future for years. It was a very clever plan. The book’s design is very appealing; the lively and highly engaging text is combined with full-page illustrations created using pencil, ink, rubber stamps, halftone photographs, silkscreen, Zipatone, and Photoshop. Throughout the book are sidebars that offer more details about topics mentioned in the text. 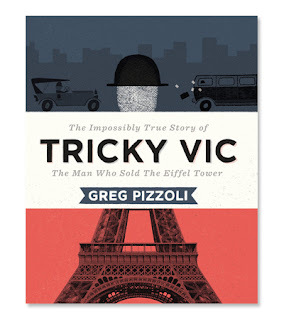 I liked how Pizzoi cleverly used prints of fingers and thumbs in place of showing Tricky Vic's face. Was Tricky Vic ever captured? Yes! Twice. The first time he escaped but was quickly recaptured and sent to prison in Alcatraz. After serving twelve years, Vic became seriously ill and died in 1947 of pneumonia. Pizzoli’s droll sense of humor makes reading The Impossible True Story of Tricky Vic an illustrious summer read.